I made these from Baked Perfection a couple weeks ago. They came out a little cakey and I prefer dense brownies. Although your ingredients are not drastically different, they look denser. I may need to try these next time! Oh my! These look wonderful–so beautiful and delicious! Yum! The things you post always end up being my favorite recipes! These look amazing. 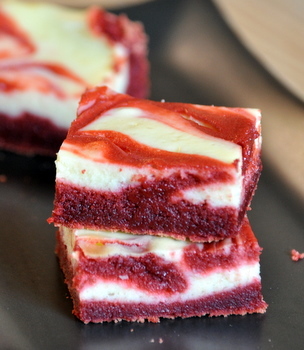 The moistness of the brownies and cheesecake really makes for a rich, rich red. Bookmarked! These look beautiful! 🙂 Will definitely be making them soon! 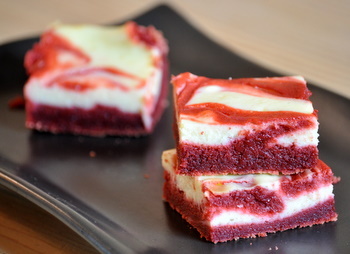 Can’t wait to make these for my red-velvet-loving friend! I love red velvet cake! I recently made a layer cake that I found on Bakerella’s blog that was fantastic. I now need to make these brownies. These look amazing–and Christmas-y. Definitely trying these soon. Thanks for the recipe! After seeing these pictures, am I supposed to do anything other than DROOL on my keyboard today???? I found your blog yesterday and have been drooling ever since. Thanks for sharing such wonderful recipes. I can’t wait to try some of these this week! Looks very yummy and beautiful! 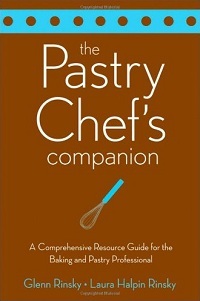 I’ve been trying to find the perfect recipe to get me started with baking, and this might just be it! Not only does it look gorgeous, but it seems relatively easy to make as well! I might give it a go for Christmas – wish me luck! Wow, these are wonderful! I made them today and colored the cheesecake component green so they are extra festive. These really are red velvet-y. Great job on these! Just made these and they look and taste amazing. Thanks for the recipe and inspiration, Nicole. Now, we’re onto your Chai Snickerdoodles. Everyone LOVES those. Fantastic recipe… well done!! It is truly beautiful too! These definitely have that WOW factor. I just made some red velvet brownies, but used a boxed mix. I bet yours are a million times better since they are from scratch. These are amazing! Gorgeous and delicious. I made some last week and they have been a huge hit at work and with the family at Christmas dinner. Mine didn’t turn out quite as vibrant though and I like the fewer swirls that you did. Thanks for sharing this great idea. This is such an awesome, creative idea! Thanks for posting. I made these over Christmas weekend, and my family loved them, though my swirling didn’t look as pretty as yours. I found that they tasted better after refrigerating them awhile, but that might just be me. Just made these & can I just say, Nicole – that I love you? your recipes are always spot on and reliable. 🙂 thank you!! these came out great! i only baked for 30 minutes and it was more than enough time. I made these for friends and they were amazing!! They did not last long…Thanks for sharing!! OMG these were a huge hit at my office. i put them in a heart tin and made them for Valentine’s Day. thank you so much for your recipes i had people BEGGING for more! I’ve got them in the oven!! They smell SO good!! made these this weekend, and they were perfect! i brough them to a bridal shower, and they got rave reviews!